Representing the family's fourth generation of winemaking, Alessandro is an impressive human and adept winemaker. The estate focusses on two lines of wines, De Stefani and Redentore. De Stefani wines hail from the older vineyards and tend to be more age-worthy offerings. The Redentore line features fruit from the younger vines and celebrates fresher, drink now, style of vino. 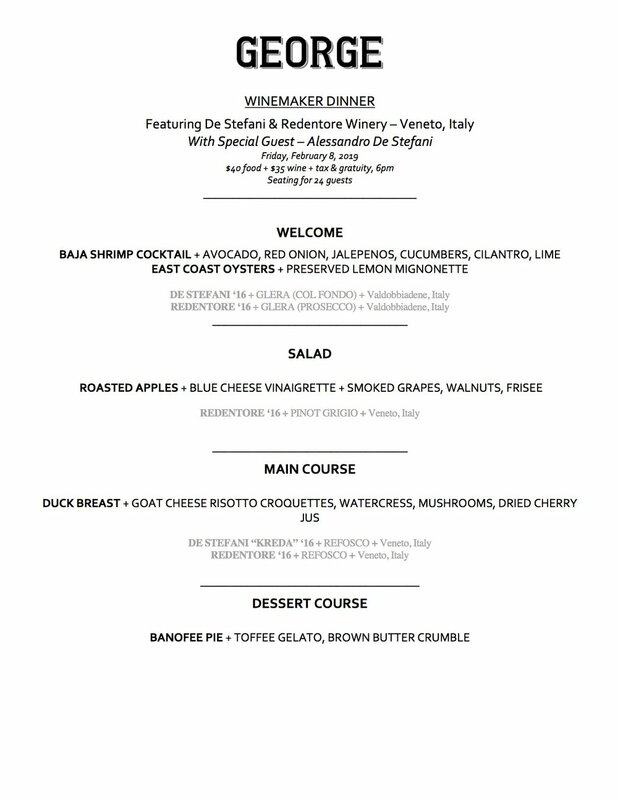 Join us for a casual family style dinner to kick off our first wine dinner at George Restaurant! See below for full menu. Sales tax (8.6%) and service (20%) are included in the purchase price. No need to bring confirmation with you to the event. As soon as your purchase comes through, we will add you to our reservation list. You simply need to give us your name when you arrive. Please contact us at 801-487-0699 if you have any questions about the menu or other details.